The Urban Sneakers Conference 2018 was held at SJ Kunsthalle, Nonhyeon, on Nov. 7. 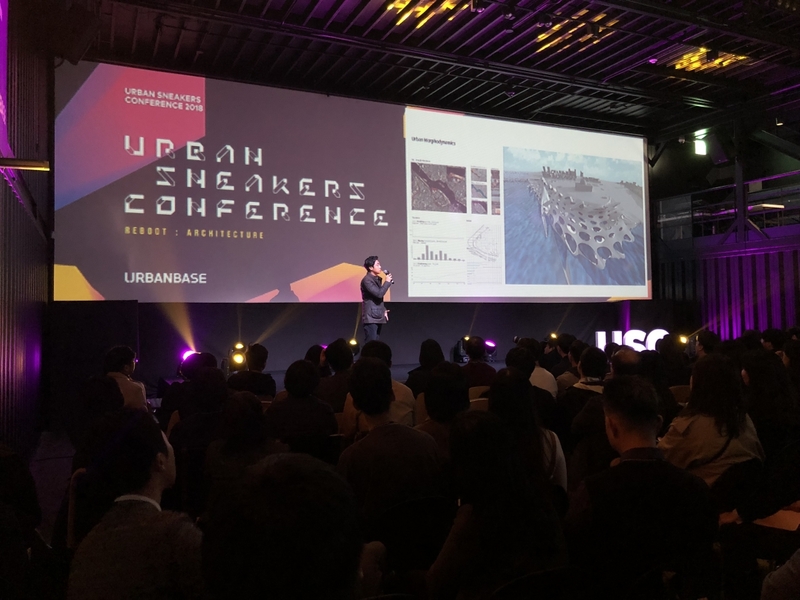 The purpose of this event, hosted by architecture start-up URBANBASE, was to observe new trends in the architecture world in the era of the fourth industrial revolution. The conference invited experts working on architectural projects converging with new technology, such as augmented reality and artificial intelligence, and consisted of presentations and a panel talk. In his presentation ‘The New Possibilities of Experimental Architecture’ Taehyun Terry Lee (principal, THE A LAB) touched upon the fusion of architecture and biotechnology, and of the ways architectural design is using data analysis technology to remain responsive to the environment, aspects in which he has had a consistent interest since studying in England. Lee Taehyun explained that as the development of 3D printing technology has helped us to create more and more complicated forms, increasingly experimental projects are being carried out overseas, such as in the Netherlands and England. He noted that ‘productive results are produced not just with the new technology by itself, but when the architect’s ideas and innovative technology are combined’, adding that ‘we need to be able to think comprehensively based on a deep understanding of manufacturing related technology in order to lead in this ever-changing time’.